Miyu's Blue Garnet is B5-sized and 24-pages when counting the covers. The cover illustration is repeated inside which turns out to be a good thing, as the version on the cover is actually cropped from the full image inside. 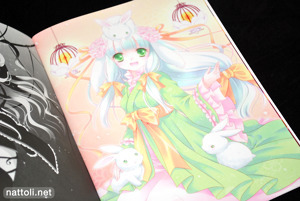 The book is in color up until page 15 at which point it switches over to monochrome works, sketches, and the index. Miyu's style stays consistent with her more recent releases; plenty of lacy, detailed dresses in soft pastel colors with a focus on a warmer palette. 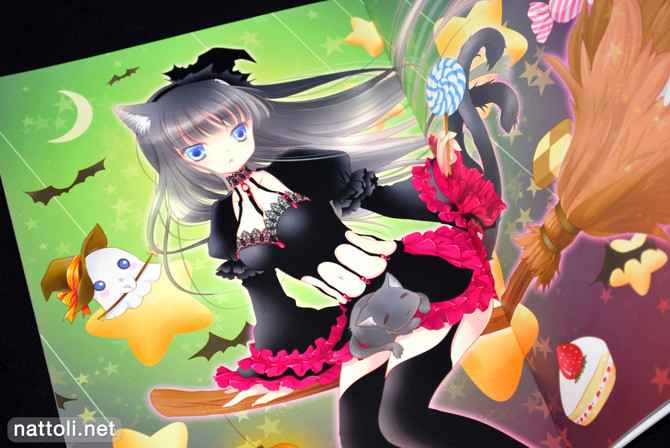 Additionally, her adorable nekomimi and inumimi girls have made a comeback, along with a lovely Year of the Rabbit illustration featuring a girl with floppy bunny ears. 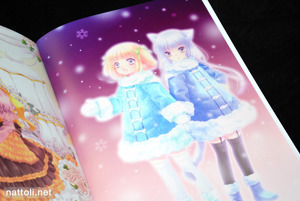 Blue Garnet features a total of nine color illustrations over twelve pages, which is the same amount as her summer Comiket 78 release Mitsu*Mitsu Visual Book.